This is intended for the newer model Browning T Bolt with the helical magazine. Be warned that any of the following actions will void Browning’s warranty. Though this has proved safe in my rifle, I take no responsibility for accidents or damage that may occur due to anyone performing this action. As with anything involving firearms, make sure the firearm is unloaded prior to undertaking any work. It is the responsibility of the owner to make every effort to ensure that the firearm is safe before using it after modifications. Making sure that the rifle is unloaded, remove the action from the stock being careful not to lose the screws. Relieve tension on the trigger adjustment screw pictured below. Loosen the trigger assembly retaining screw entirely using the same Allen wrench used to remove the receiver from the stock. Lifting slightly on the rear of the assembly, slide entire assembly forward and off of the rifle. Don’t worry, there aren’t any springs and/or parts that will drop out. Lay the trigger assembly on its left side and identify the three locking tabs shown in picture below located on the left side of the housing. Keeping outward pressure on the sides of the unit push the tabs into the unlocked position. Once the two parts begin to separate, use a flat-blade screwdriver to gently pry the two sides apart with the assembly laying on its right side (left side up). Again, there are no parts likely to drop or fly out a long as you use care. Examine the relationship of the various parts, especially where the trigger spring (B) rests on the trigger housing ledge (A). This is important for reassembly. Remove the trigger spring. This just lifts off the pin. If the pin comes along with the spring don’t panic. Just reinsert the pin making sure that it also is pushed into the retaining hole in the housing behind the sear. 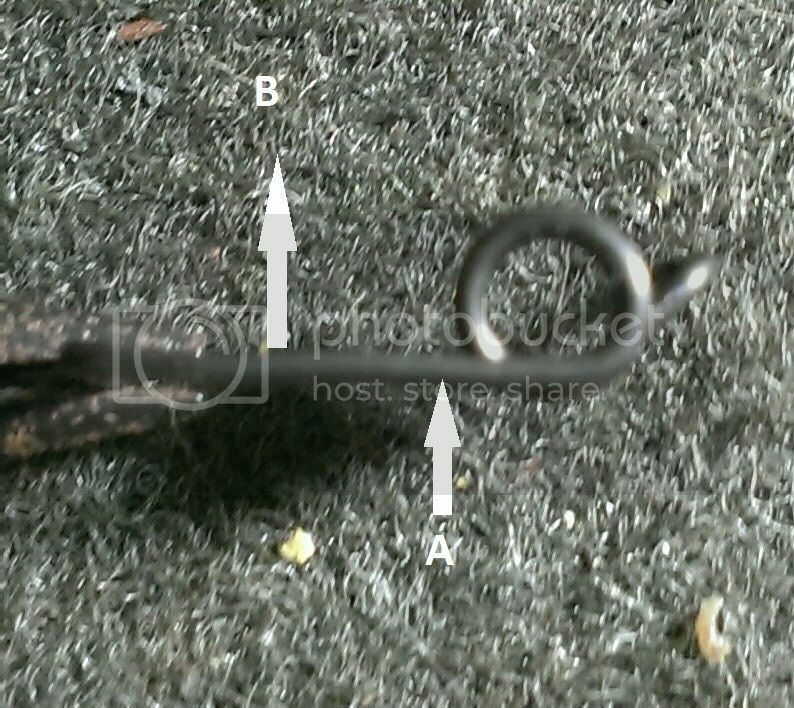 Supporting the spring by the coils, bend the spring arm (A) upwards (B) perhaps 1/16 of an inch. Keep the bend as close to the coil as possible so that the arm itself remains straight. Reassemble the spring into the housing making sure that the short leg is properly seated into the hole in the sear assembly and the long leg is resting on the shelf mentioned earlier. Snap the housing cover back into place and reassemble trigger unit to the receiver. This works best with the bolt pulled back out of the “locked” position. Once everything is back together, test the trigger pull. If still too heavy, repeat the above until the trigger is a bit too light. Now use the trigger adjustment screw to apply tension a little at a time until you are satisfied. It is possible that your adjustments might enable the bolt to be removed (or fall out) with the safety on and the bolt open. 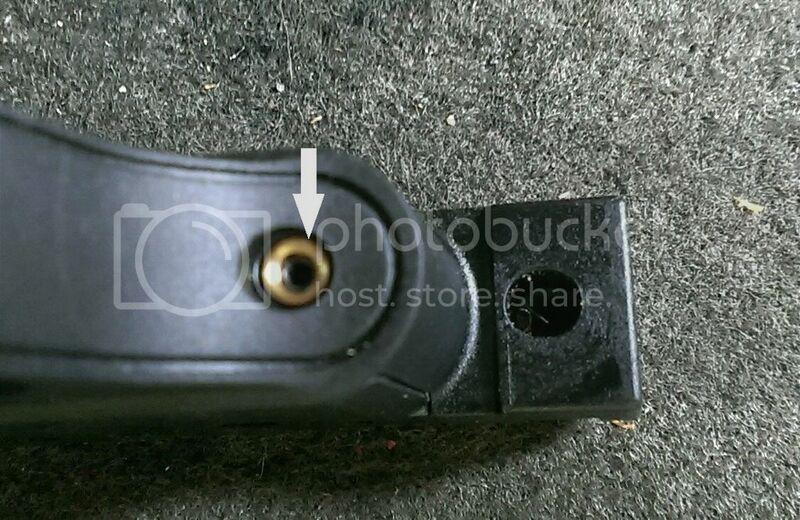 If this is important to you, adjust the trigger adjustment screw inwards to increase tension on the trigger spring. Continue a little at a time until the bolt fails to fall out. This will probably increase the trigger pull somewhat but is the price paid for this arrangement. When satisfied, finish the reassembly of the receiver to the stock. I’m not going to go unto the details of polishing or stoning surfaces and etc. That is too critical and far too easy to get wrong considering the importance of various angle relationships. I was able to get my trigger down to one pound and 14 ounces with a full polish and spring adjustment. Only adjusting the spring dropped it from 3.5 pounds to 2.0 pounds. 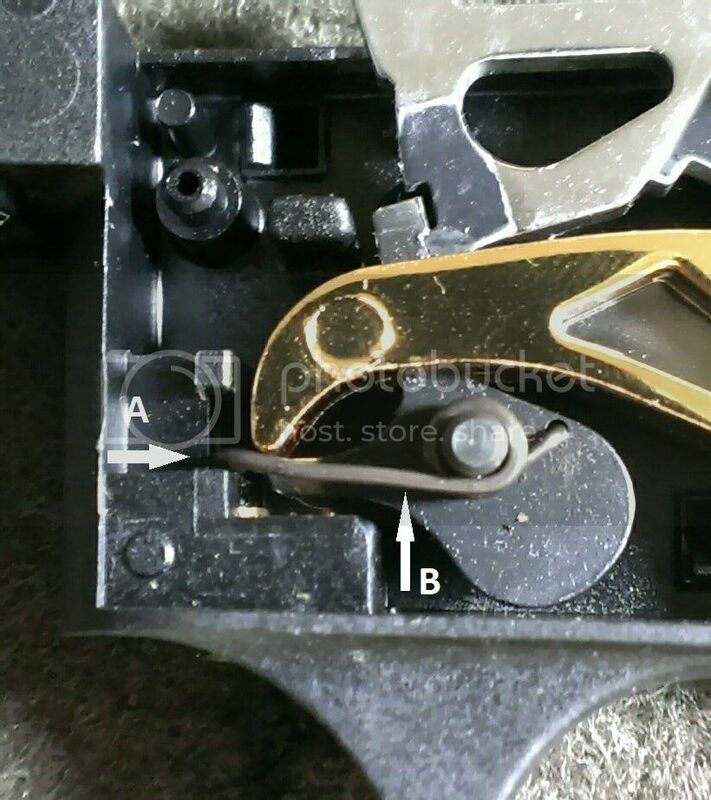 The advantage to bending the spring is that it makes that trigger adjustment screw actually do its job. Screw it in and it increases trigger weight. Back it out and it lessens weight. It allows much finer tuning than the factory set. When I do any action work I never load the firearm until it endures five or six vigorous blows from various angles administered with a four pound rubber mallet. If everything stays engaged, it’s good to go to the range for further testing. Good on ya bud, Im sure someone will be in need of that at some stage...good honest "how to do" can be hard to find. Nice job SSL! Elvis, did you notice the great picture to go with it? More pictures than words. SingleShotLover, Thank you very much for taking the time and effort to post your solution to the problem with T-Bolt trigger pull. I was on the verge of trading in my new T-Bolt because the trigger pull was too heavy and the factory adjustment did not reduce it substantially. I love everything else about the T-Bolt, and now I love the trigger too. Thank YOU! First, welcome to the best forum on the web! Lots of friendly and knowledgeable people here willing to help and befriend you. I am glad to hear that I was of assistance and you were able to improve your T-Bolt's trigger. Like you, I had only that single dislike concerning mine and am really surprised that Browning has never addressed that issue. Just be sure to thoroughly test your trigger and safety before you trust it entirely. Good shooting and stay safe! Welcome to The Nut Crater. Grab a beer and pull up a seat mate. As SingleShotLover said, there are plenty of good people here (ALL of them are great and with a wealth of knowledge) who are more than happy to share their experience and knowledge. Likewise, don't be afraid to jump in with your experience and knowledge mate...it will be well accepted. If needed, the guys can steer you towards the Safety Ladder for those times when our resident sweetheart Suz gets a bee in her bonnet and brings out a switch. Seriously though, she's a real sweety who like the rest has plenty of experience and is happy to pass it on. Your words may be "tongue in cheek" Suz, but they highlight a very pertinent, serious and potentially deadly issue mate. Everyone expects a firearms owner to ensure the firearm is unloaded prior to doing anything other than actually shooting, but all too often this is not the case. I think people become blase about weapon handling because they do it so often. I can recall trained soldiers neglecting to carry out safety precautions (ensuring the firearm is unloaded and safe) before doing anything with the firearm, even after having handled firearms for years, training with them two or three days a week. Oh I know it's happened to me! Almost shot my dad with a BB gun one time, luckily I wasn't aiming at him but next to him and in the house. It was a pellet gun that had been sitting around for years and you couldn't tell if it was loaded or not but the pellet was in there non the less and I pumped it up and pulled the trigger thinking I'd just hear a pop and what I heard was a pellet hitting a window. I only pumped it once thank goodness. But the next time I work on a gun I'm loading it first just to see what happens. That's just how I am, kissing danger on the lips, skirting disaster and takin one for the gipper just to prove a point. Suz, I had the same thing happen long ago. An old BB gun had been laying around for years. I opened the bolt to see if it was clear, but did not look down the bore. I pumped it up to check the seals, pointed it in a (relatively) safe direction and promptly shot a hole in a cardboard box full of glass ware. (Why is it always glass?!?!?) Lesson learned with no injuries and minimal expense. Pumpkin it's always glass, some sort of Karma I guess...Oh I got another one....very embarrassing too...I was showing my brother in law a rifle and so proud of the trigger job I'd done on it, told him to pull the trigger. An ex-military man he opened the breach and found a live round. Thank his memory for doin that. I had gone hunting with the rifle and because of the rain and blustery weather I decided to unload it when I got home to clean it. Well I got home took a hot shower to warm up and got something to eat and totally forgot about the rifle. Couldn't believe I left it out of the gun cabinet the next day and put it away, even without cleaning it...I'd make a poor momma too....well you know the rest of the story.